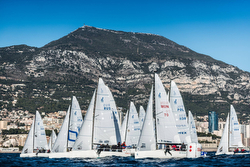 (Monte Carlo, Monaco)- A total of forty-plus teams will be participating in Act III of the J/70 Monaco Sportsboat Winter Series, from January 17th to 20th, sailed on Hercules Bay just off the fabulous, majestic, mountainous setting off Monte Carlo. Hosted by the Yacht Club de Monaco, the international contingent of teams from Finland, Denmark, Russia, Brazil, Great Britain, Germany, Switzerland, Italy, Ukraine, Ireland, and France are looking forward to yet another amazing weekend of racing off the famous Principality of Monaco. Will the all-Monegasque podium hold together like they did in the first two regattas? Or, will there be more intense battles for the top of the leaderboard? In the previous event, it was an intense battle between Nico Poons’ CHARISMA (winner of Act II in December), Roberto Stefani’s PICCININA and Ludovico Fassitelli’s JUNDA (winner of Act 1 in November). Perhaps there will be other protagonists that step into the field of battle to tip the results in another direction?! In the all-amateur Corinthian J/70 class, it was Swiss sailor Bruno Zeltner’s QUARTER2ELEVEN, a regular at the Monaco Sportsboat Winter Series, that pipped Monegasque Cesare Gabasio’s TINN J70 for the win. Can the Swiss sailors do it again after a massive New Year’s Celebration and skiing with too much kirsch and delicious cheese fondue in the Swiss Alps? Time will tell. For more J/70 Monaco Winter Series sailing information Add to Flipboard Magazine.